I still needed to complete 1,200 stitches for the Full Coverage challenge so I started on page 16. I got my stitches done and put this one away until April. Since I was done early this month I pulled out Bless our Harvest. I did not stitch every day but made some good progress on it. I made a stop at my local LNS as I was running out of some colors on Little Fairies at Play. While there I went thru their clearance area and found this chart that I saw either on Just Keep Stitching with Steph and Pam or Sunshine Stitchers. It had a chart for a Bumble in it and my sister collects bumbles. Then I also got the needed floss and a small piece of light blue aida that I am stitching the Bumble on. I have not discovered any new designers but I am watching Floss Tube now which is exposing me to different designers than I would normally pay attention to. This month's question is what do you listen/watch when stitching. I have just discovered Flosstube. I tend to watch that when my husband is at work. Otherwise whatever he is watching. The less interested in it the more stitching I get done. We spent a week in Florida visiting my in-laws. So I did not stitch every day this month. My weekly project was Butterfly Night which is stitched on evenweave. I struggle to stitch on evenweave. My stitches are a mess so I hate to work on this project. I worked on filling in the moon. Glad to put this one away and switch to another project a few days early. On the weekends I worked on Little Fairies at Play and completed 2,787 stitches. I almost have page 15 done and should finish it up in March. To make sure I get my page finished and at least 1,200 stitches in I will work on this project on weekends and during the week until page 15 is done and 1,200 stitches completed. Bless our Harvest will be back out for the few remaining days of February and as soon as I have page 15 and 1,200 stitches done on Little Fairies at Play I will work on it for the rest of the month. I did manage to read 4 books this month (3 while on vacation in Florida). Looking forward to some warmer weather for March. January was an excellent stitching month. I had 29 days of stitching. I stitched for a total of 91 hours. I had 3 separate days off in January so that added to my stitching time. I will not do as good in February as we will be gone to visit my inlaws in Florida for a week. Faces of Faery 90 was my project for the month of January. I stitched on her during the week. I almost have page 2 finished. Need to fill in the confetti stitches and I will be on to page 3. Little Fairies at Play is my weekend project. My goal is 1,200 stitches a month with the aim of finishing a page every three months. So I really have to do more than 1,200 stitches a month for a page finish. In January I did 3,347 stitches. I am at the half way point of page 15. And here are my Orts for January. The question for this month is what SAL are you participating in for 2019. I am in the Full Coverage Facebook group 1,200 stitches a month and WIPocalypse. Both motivate me to make progress on my projects. Hi I am Cathy and I have been participating in WIPocalypse since 2012. I currently have 6 active WIPs in my rotation. I tend to do larger full coverage pieces so I do not get too many finishes. My WIPs for 2019 are listed in the WIPocalypse 2019 tab. My goals for 2019 are to stitch on all of my projects at least twice this year. 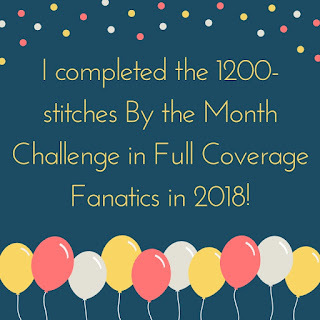 I am participating in 1200 stitches a month with the facebook group Full Coverage Fanactics. I participated in this stitch a long in 2018 and made alot of progress on Little Fairies at Play. I have added 2 pages to this picture since I moved the scroll rods. January - Faces of Faery 90 during the week and Little Fairies at Play on the weekends. March - Little Fairies at Play all month until I finish page 15. If it finish the page before the month ends I will stitch on Bless Our Harvest until the month ends. My goal is to finish 4 pages on Little Fairies at Play this year. I have my eye on a finish on this piece in 2020. I do not know if I will start any new pieces. I do have one kitted up ready to start. I have so many beautiful patterns in my stash that I will not need to buy any. I also have a large tub of finished pieces that need finished off. I am working on turning a spare bedroom into my craftroom/office. As that progresses I might be able to work on framing or finishing some of the pieces in the finished tub. Thanks to Melissa for hosting WIPocalypse. I always enjoy seeing what everyone is working on. This is the final post for 2018 WIPocalypse (I am late). 2018 was a good stitching year for me. I stitched o all of my WIPs twice, I had one finish and 2 new starts. December was the first time that I had stitched every day! Little Fairies at Play I worked on it all month as I wanted to finish page 14 before the year ended. I finished the page on 12/22/18. That is 4 page finishes in 2018. 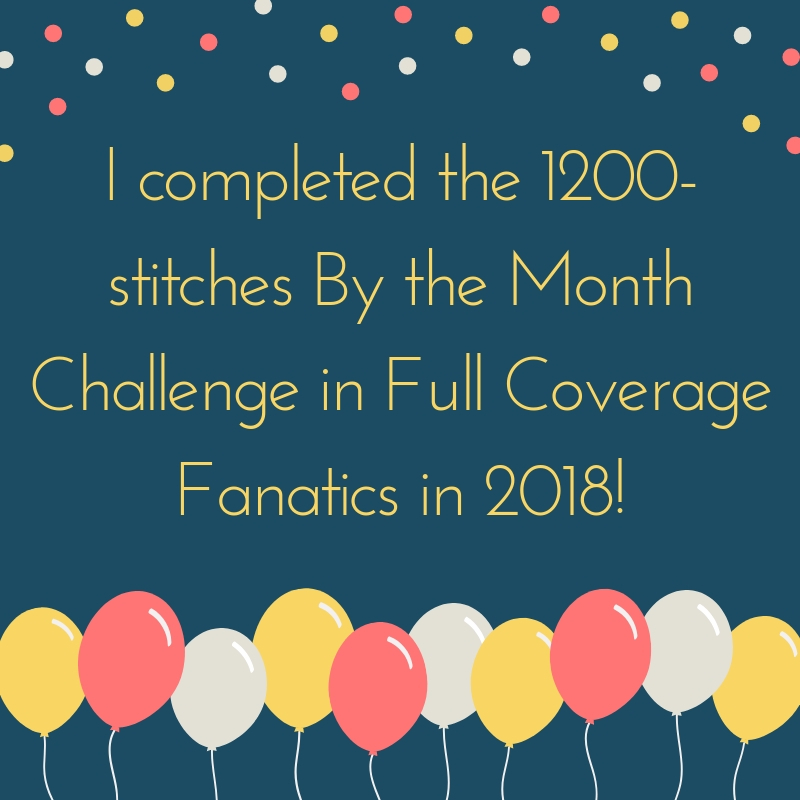 I had a goal of 1,200 stitches each month as part of the Full Coverage Stitch by the Numbers Challenge. In January 2018 I was not sure I could make that many stitches a month. But I set up my new rotation stitching on this project on the weekends and a different WIP during the week. So I worked on one project for a Month before moving on to the next WIP. I did make good progress on all of my projects this way. For 2019 I will once again be going for 1,200 stitches on Little Fairies at Play with every 3rd month working just on that project to finish the page. So in March if I finish off page 15 with days left I will work on the Owl project. I have updated my 2018 Wipocalypse page with the progress pictures for all of my WIPs. Here is a look at my Orts for 2018 and I have them in their ornament. My jar is empty and ready of a new year of stitching. And of course I worked on Little Fairies at Play on the Weekends 2,456 stitches. I hope to finish page 14 by the end of December. And my Orts lots of shades of blues, pinks and purples from both projects. Question of the month is what new stitches or techniques did you learn this month? Nothing new for me. I am still enjoying just cross stitching. I find it relaxing. I have in the past attempted to stitch on linen and use different stitches. Not for me. That project is a UFO.